2.4-liter four-cylinder 185 horsepower and 181 pound-feet of torque. History of safety, ACE body structure, dual-stage, multiple-threshold front airbags. Spacious interior, heated seats and air conditioning. A multi-angle rearview camera with guidelines, tire pressure monitoring and daytime running lights. It seems like every month there is a new crossover or hatchback vehicle to choose from, giving drivers more choices for capable and spacious vehicles than ever. Drivers that are looking for a vehicle with all-wheel drive and spacious seating for five might be thinking newer is better, but when it comes to performance it is better to go with something that you know works and has continued to improve over the years. The 2016 Honda CR-V gives drivers exactly that, a tried and tested vehicle. The 2015 model alone earned several awards. The Honda CR-V has a lot for drivers to be excited about, even at the base trim. The standard features alone are impressive, with air conditioning, a multi-angle rearview camera with guidelines, tire pressure monitoring and daytime running lights. 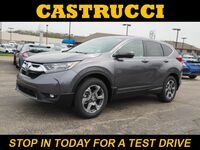 Higher trims add to the overall comfort of the CR-V and create a more upscale experience with leather trim, 17-inch alloy wheels, heated seats and dual-zone automatic climate control. 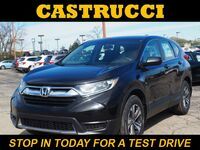 The Honda CR-V also offers a spacious interior for each trim level with 104.1 cu-ft. of passenger volume. 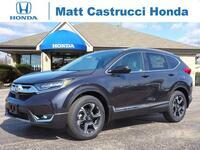 Interested in a 2016 Honda CR-V? The Honda CR-V comes with the same 2.4-liter four-cylinder engine for every trim level. This engine produces 185 horsepower and 181 pound-feet of torque, giving drivers enough power to tow 1,500 pounds. The engine is always paired with a continuously variable transmission and each trim offers the option for front-wheel drive or all-wheel drive. To give drivers a slightly more custom experience while driving, the CR-V comes with Eco assist mode for drivers that want to save on fuel and sport mode for that fun-to-drive experience. And to help keep you moving forward the CR-V comes standard with hill start assist. The CR-V rounds out the whole experience with the many safety features that it offers. Honda’s crossover comes with advanced airbags and the ACE body structure, both of which are a large part of what has earned high safety ratings for the CR-V in the past. Available safety features like vehicle stability assist with traction control, ABS, electronic brake distribution and brake assist further improve safety and handling. 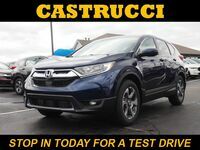 For more information on the 2016 Honda CR-V you can view our inventory online.